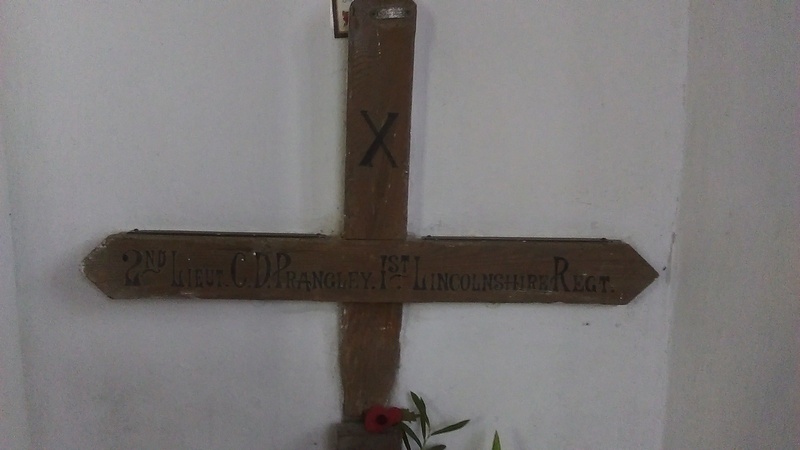 Prangley, Charles Dean, 2nd Liet., 1st Battn (10th Foot) The Lincolnshire Regt., son of the Rev. Charles Wilton Prangley, Rector of Bexwell, co. Norfolk; born 16th March 1897; educated South Lodge, Lowestoft, and Marlborough College, where he was in the O.T.C. 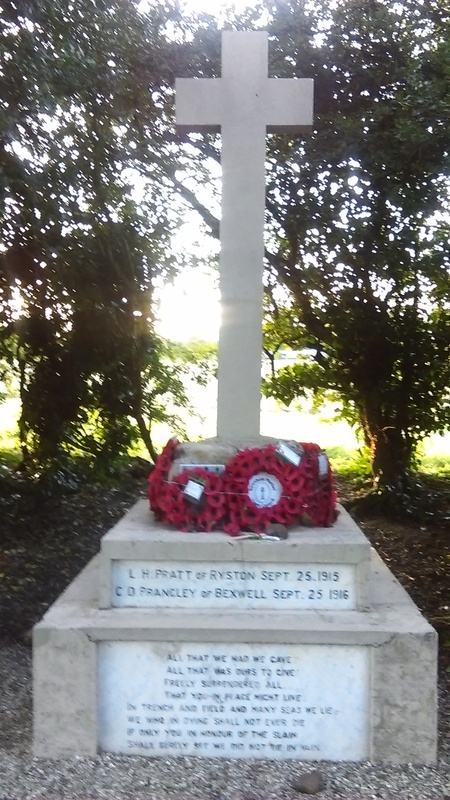 ; promoted 2nd lieut, and passed for entrance into Jesus College, Cambridge; obtained a commission in the Special Reserve of Officers 11 Aug 1915, and was posted to the Lincolnshire regiment; served with the Expeditionay force in France and Flanders from 13 July 1916, and was killed in action 25 Sept 1916, by a shell splinter in the advance on Gueudecourt. 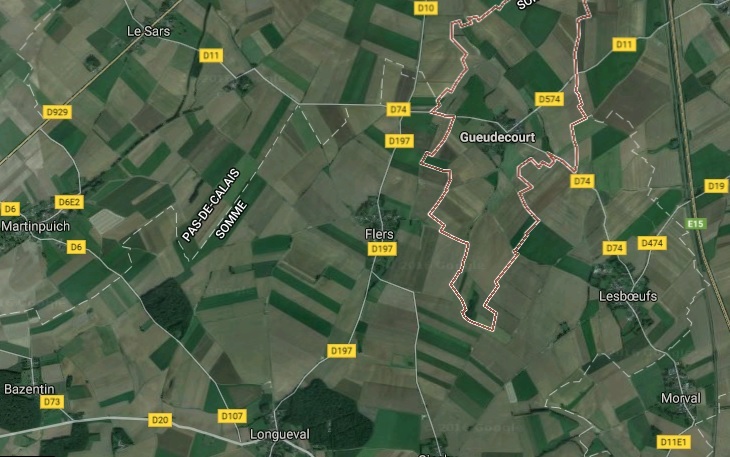 Buried 1500 yards south-south-east of Flers. His Captain wrote: "He was a singularly thoughtful fellow in every way. He worked and led as an officer should, and he proved himself self-reliant and trustworthy. He did not grouse, but worked for his men and his regiment with all his might. I had absolute confidence in him, and knew him well enought that when the hour came he would not fail. He died leading his men - a soldier could not ask more. 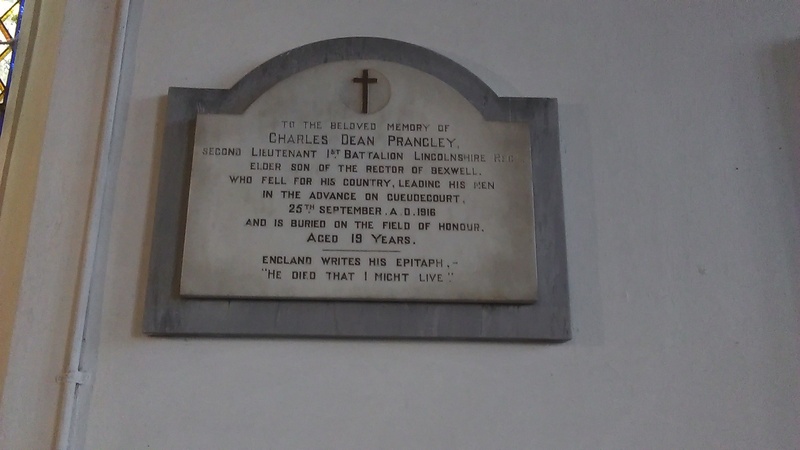 He would have made a good officer had his life been spared," and a brother officer, who went into action with him: "He died facing the enemy and leading his men, and giving of his best for his country; what could one do better?" He was in B Company which left Switch Trench as part of the advance on Gueudecourt at 12.35pm and he was killed at 12.40pm. He left his personal effects for 2nd Lieut Dring to take care of consisting of a wrist watch, purse, revolver, holster, letter and cheque book. His father had a special memorial book commissioned for him. 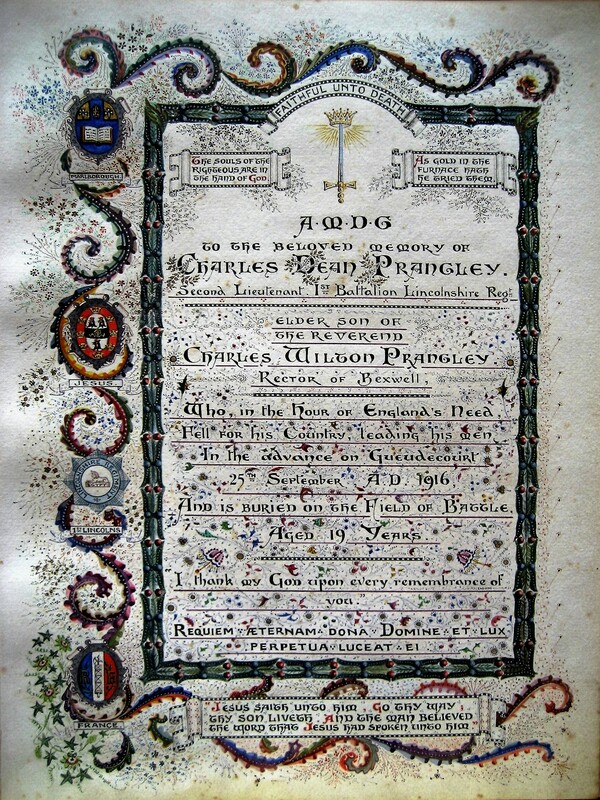 'On the dedication page appear the coats of arms of Marlborough and Jesus College, the badge of the Lincolnshire Regiment and the banner of France. On subsequent pages, there follow drawings of the font at which Doox was baptised and of St Mary's, Bexwell, St Margaret's, Lowestoft, which Doox would have attended from his preparatory school, Jesus College, and entwined within ears of wheat, grapes and vines is the name Doox. The cover is of wood taken from a tree in the rectory garden, and, most poignant of all, on the front cover is a gold cross formed from his mother's wedding ring. At the back of the missal are photos of Doox, still a boy despite his Army uniform, and of his parents, pasted onto beautiful watered silk which came from his mother's wedding dress. On the last few pages are the signatures of the then Archbishop of Canterbury, Randall Davidson, a future Archbishop of Canterbury, Geoffrey Fisher, who had taught Doox at Marlborough, and a future Bishop of Bath and Wells, Wynne Wilson, who had also taught Doox'. The missal, always since known as the Doox Book, is now at St George's Memorial Church at Ieper (Ypres), as is Quis Separabit? which his father also wrote. 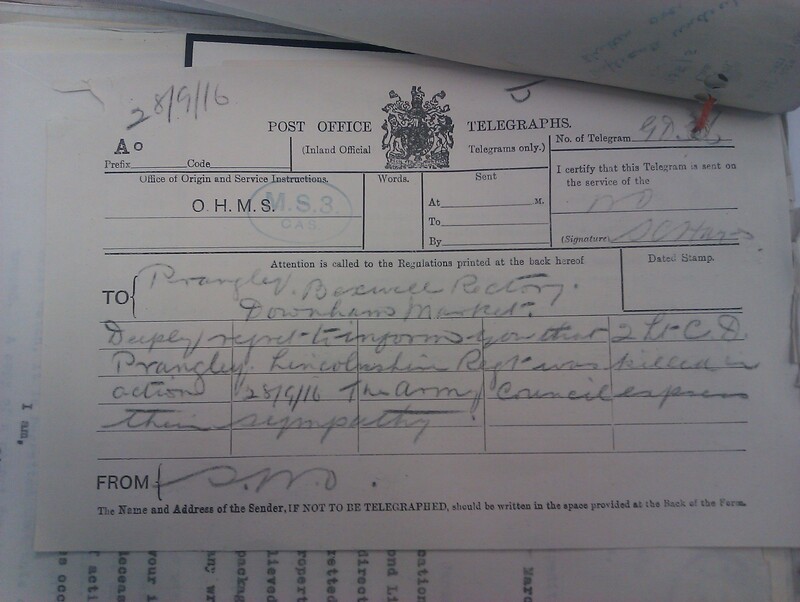 Additional information: Son of Charles Wilton Prangley and Elizabeth Prangley, of Bexwell Rectory, King's Lynn. Grave/Memorial Reference: V. D. 7. 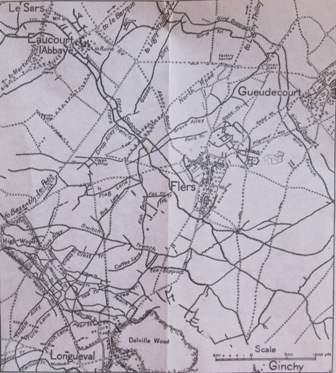 Lesboeufs was attacked by the Guards Division on 15 September 1916 and captured by them on the 25th.